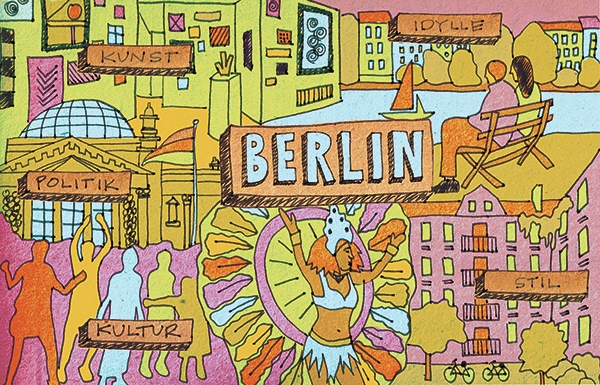 Hand-drawn postcard illustration for a special magazine by Die Rheinische Post newspaper about the evolution and draw of Berlin. Published April 2012. Illustration for a special section in Die Rheinische Post newspaper about Berlin, for a story full of tips and tricks for traveling to Berlin with the little ones, and where to find the most stylish jams and family-friendly activities. Published October 2012. Illustration for the cover of the weekend Culture section of Die Rheinische Post newspaper, exploring the city of London in anticipation of the 2012 Summer Olympics. Published May 2012. Commissioned illustration of landmarks in the beautiful Burlington, Vermont. Created February 2013.